The very last type of the great Focke-Wulf family of fighters, the Ta152H saw service in very limited numbers at the very end of WW2. The type had a top speed of 472mph, making it one of the very fastest poston-engined fighters of the war. It was allocated only a small numbers to JG301 and very few pilots got to actually fly these aircraft in combat. One who did was 'Ace' Willi Reschke and he scored a number of victories with the type, including a Hawker Tempest in April 1945. Nick Trudgian's awesome painting depicts this victory with the large wings of the Ta152H particularly in evidence. This image was released as a VERY limited print release of only 50 for the 'Portfolio Edition' of his Air Combat Legends Volume 2 Book release way back in 2002. This superb and visually stunning painting measures 24 x 14 Inches and is Framed in a Custom-made Frame that has been personally rendered by Artist Nicolas Trudgian to compliment the colours of the Painting. 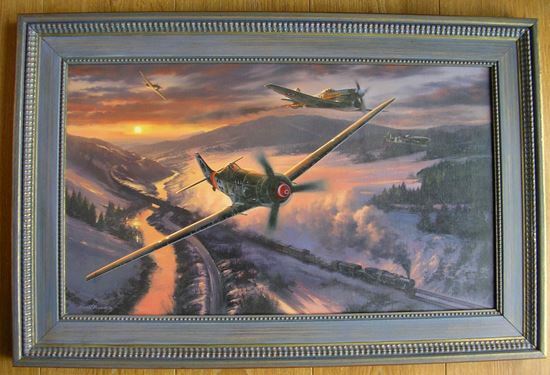 A very RARE opportunity to acquire one of Nick's paintings of a legendary aircraft of WW2. Potential buyers are advised to contact me regarding Shipping Costs for this item. For UK based customers I may be able to deliver personally depending on location.